← Does it make my FAL look fat? Ever wondered where all those Keltec rifles end up? The zombies are hoarding them for the apocalypse. Preferred caliber is 300Blackout, of course. When the night of the living dead comes, they won’t have to stumble around hoping to snag a slow human. Why try to catch the brain carrier when they could knock the brain right out of the skull with hydrostatic pressure and then savor at leisure. 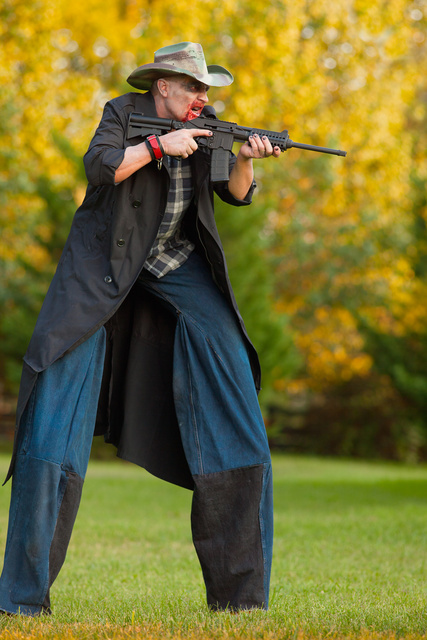 Ten foot tall zombies with guns. There ought to be a law or something! This entry was posted in humor, rifle and tagged 300Blackout, keltec, SU16, zombie. Bookmark the permalink. 9 Responses to Ever wondered where all those Keltec rifles end up? Nightmares: A squad a riflemen/zombies is right up next to flying tarantulas. Now that was an interesting picture, who did the make up and costume? Thank you April….come check out my fan page on Face Book @BIG Country Zombie…..(zombie drool)…. Most of the zombies we deal with in my neck of the woods hold their weapons sideways.